Powerfully aromatic rosemary has multiple uses from skin care to aromatherapy and DIY cleaning recipes. Known for antibacterial, antifungal, antiseptic and antiviral properties. The scent of rosemary is a great pick me up. Our dried rosemary is organic. Approx. 15g in reusable glass jar. Rosemary is reputed for reducing excess oil. That’s why this fabulous herb is often found in facial cleansers and other organic beauty products made specifically for those with oily skin. It won’t leave your skin unnecessarily dry, which causes your skin to produce more oil leading to breakouts and greasiness. This beauty-enhancing herb also offers anti-inflammatory properties. Rosemary can help reduce redness and puffiness, like tired eyes and wind-bitten skin—two all too common beauty ailments during winter. When used in beauty products, rosemary can enliven your skin. Rosemary is known to stimulate circulation, which will increase blood flow and bring nutrients to the surface. This will make your skin glow, and when used in a facial or body cleanser can also remove dirt and toxins from the skin. Rosemary contains powerful antioxidants that diminish the skin-damaging effects of free radicals and contain anti-aging properties. The stimulating properties of rosemary help restore elasticity, making skin firm and supple. Rosemary also encourages cell growth, which will reduce fine lines and wrinkles. Its healing effects can also mask broken capillaries and age spots. As anyone who has smelled the spicy woody scent of rosemary knows that it instantly invigorates the senses. The scent of rosemary revs up your energy, making it a great addition to your morning ritual. Rosemary has even been shown to boost brainpower! 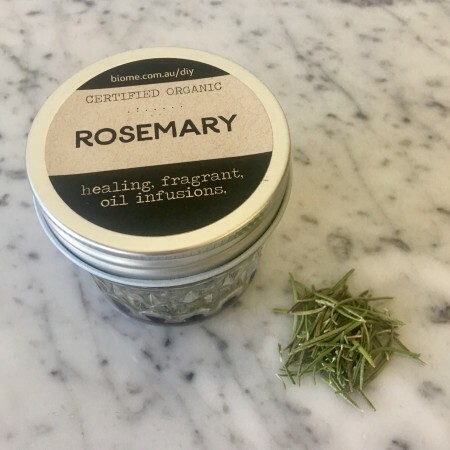 Thanks to rosemary’s potent antibacterial, antifungal, antiseptic and antiviral properties, rosemary based homemade cleaning products are amazing to have on hand for kitchen countertops and bathrooms surfaces. Looking to simplify, reduce waste and know exactly what you are putting on your skin? As well as online here, all the Biome stores offer a range of these raw ingredients in convenient size reusable glass jars. At the Balmoral store (216 Riding Road) Naked Beauty Bar you can buy these and more natural ingredients in bulk for just the amount you need. BYO glass jars or choose from our containers to suit.